So, we dyed a few eggs the other night. I think this must have been some sort of bribe I gave Nezzie at some point, probably having to do with the potty. Here are some of our results using brown eggs. I love the different hues we get from using brown eggs. We’ll probably have a mixture of white and brown when we make the big batch with everyone this weekend. 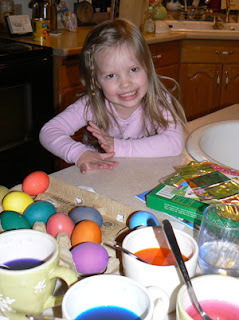 Nezzie had fun, and we only had a few cracked eggs in the end. I love the brown ones too! I miss those colors. I could buy them but that just goes against nature for me. I went and got some easter stuff last Friday and was in a quandry from all the different kinds of dye kits you can buy now. I went with the tried and true but still….have you SEEN them all out there? Wow! it’s already time to dye easter eggs? doesn’t easter seem early??? dang it! I hate when I don’t proof read my comments before posting them! you have to dye the brown eggs, and if you don’t have the little dye tablets, i think you can use food coloring and vinegar or something (i think i read that in martha one year). regardless, you can probably find something online. 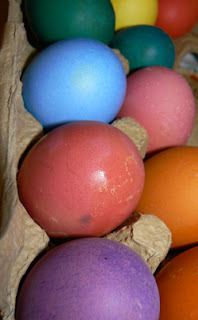 but if your mom brought stuff over for you, then just ignore everything i just suggessted, besides dyeing the brown eggs. Beth, my parents had a good giggle at your being afraid of the brown eggs. I think I remember that, too!